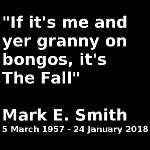 On the 24th of January 2018 Mark E. Smith died. Concerts were cancelled in late 2017 but The Fall not appearing at a scheduled event was not too much of a surprise. He had been ill for a time, however, he had not really looked well for over 20 years so fans around the world were shocked. He then managed to perform at a couple of shows from a wheelchair so we all thought he must be getting better, but it was not to be. While John Peel was the driving influence that lead us to create Dandelion Radio, The Fall and Mark E Smith were a strong influence on our musical tastes. We played Fall tracks more than any other artist in the first 10 years of Dandelion Radio - over 180 times and well over 200 after you add in the tracks from these two tribute shows.